Banana Berry Oatmeal Cups - Energetic Juniors - Contact Us! Studies show that kids who eat breakfast are more alert during the day and perform better in school. Breakfast jumpstarts children’s days, giving their bodies fuel to maintain their energy throughout the morning. With early mornings though, it can be tough to get kids fueled up before they leave the house. These oatmeal cups can be made a head of time and customized to your child’s preferences and dietary needs. Try making a large batch of these on the weekend, and freezing in individual portions for fast and easy weekday breakfast that can even be eaten on-the-go. Preheat the oven to 375°F. Line a 12 cup muffin tin with paper liners. Combine the oats, cinnamon, baking powder, salt and brown sugar in a large bowl. In a separate bowl, whisk together the bananas, eggs and vanilla until smooth. Mix in the milk. Pour the wet ingredients into the dry ingredients, and stir well. Pour the mixture into the muffin tins. 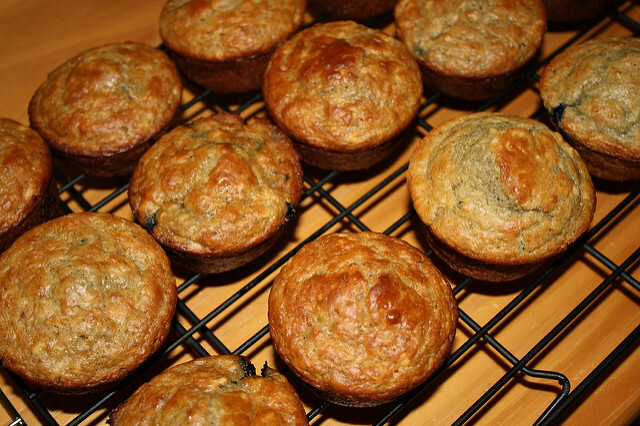 Bake for about 16-20 minutes, or until tops of the muffins are slightly puffed and brown and muffins are cooked through. Cool completely before storing. Muffins can be kept in an airtight container for 3-4 days. After that, individually wrap muffins and freeze. To defrost, either leave at room temperature overnight or defrost in the microwave for about 30 seconds.